Last month we took a look at the city’s plans for the redesign of LaSalle Square. The city is planning to make Empire Street two-way for the entire length (from Weybosset/Broad to through the square to Sabin Street). The city has had some back and forth with RIDOT on the issue, so the current plans do not reflect two-way Empire Street. I’ve given some thought to how Empire should move through the square and above is a drawing of my idea. Make Empire and Broadway one continuous through roadway. Make Sabin end at a T at Broadway/Empire. This makes for just two light movements. Broadway/Empire green with no turns, just straight through. And Sabin green with left and right onto Broadway/Empire. No need for special light cycles to get different turns accomplished, very easy predictable geometry for drivers and pedestrians. If the lights are timed right, one should be able to drive from Broadway and Dean to Empire and Weybosset and beyond without stopping. Aborn Street, which runs between the Dunk and the Hilton is technically a public street, though it does not actually run anywhere and effectively acts a driveway for the Dunk. Since it has almost no public traffic, I’ve downgraded it from a full street to a plaza-like configuration. The street climbs up onto the sidewalk, bollards on the sidewalk mark its path. See the plaza at the RISD Chase Center for an idea of how this would work. The Chase Center plaza doubles as open space and a loading dock for the Museum and other adjacent buildings. 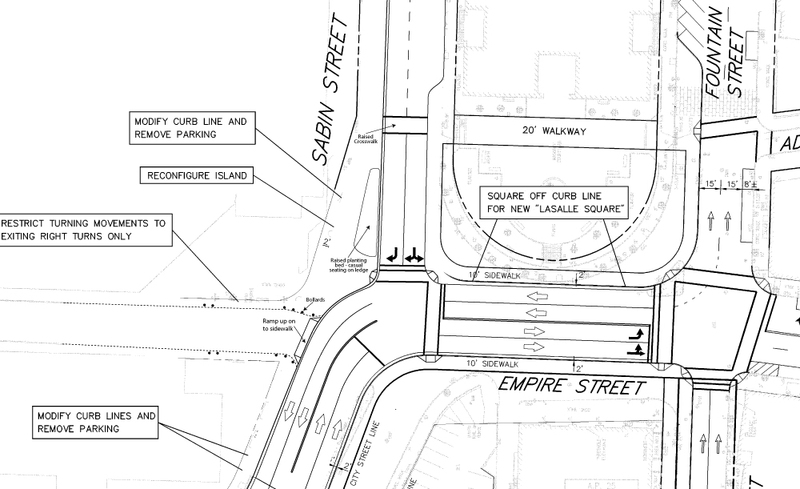 Sabin Street is pulled away from the Dunk to make it meet Empire/Broadway at a right angle. The space where Sabin used to be outside the Dunk gets replaced with a raised planter that can double as casual seating along the planter ledge. This puts a barrier between traffic and pedestrians and also funnels pedestrians along the sidewalk properly. At the Aborn end of the Dunk there is currently a sad little plaza that could and should be upgraded to make a small pocket park outside the Dunk. There was a small, not too terrible, pocket park at this location prior to the Dunk renovation, it was behind the giant electronic sign and really underused before. Having a park that is more open to the street, combined with more foot traffic in LaSalle Square would make for a more successful park at this location. Did the original plan show an allowance for a bike lane in both directions? Is that what the 2′ near the curb indicates? The square-off looks good and would work on Fountain Street as well. Traffic flow wouldn’t be impeded because Sabin and Fountain are one-ways that would feed the southbound (or outside)lanes through the square. It still is baffling why 15′ wide lanes are necessary on Fountain Street. Maybe they’re reserving the ability to make the street two-way in the future. It would make it easier to add streetcar rails, although it’s doubtful that’s what they were thinking. The T at Sabin and Exchange is not a good solution. When something is going on at the Dunk, having traffic back up at a light on Sabin could be a problem. Its far easier to allow traffic to merge instead of having it come to a complete stop to make left hand turns (across a traffic lane) from Sabin to Exchange and Exchange to Fountain. In essence, Sabin, Fountain and the one-way section of Empire create a circulator for the Dunk and the Convention Ctr. Its the most efficient way to move traffic when you have thousands of people coming into the City for an event. It also lets people who are not coming in for that event a quick way to get through the area. 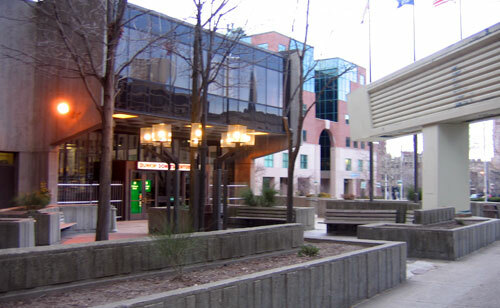 The city is intent on having Empire be two-way straight through the square. I believed they toyed with the idea of having the square act as a round-a-bout (a square-a-bout) with a lane running right up against the BCBS Building, this would allow for mostly merges and few lights, but then the square itself would be separated from pedestrians, who would have to cross the flowing traffic. If traffic proves to be problematic during Dunk events, the police could divert westbound Empire at Washington so that the westbound movement would go away during peak traffic periods. I don’t think special event traffic should trump regular daily traffic flow. Dan makes a good point. When there’s an event the traffic is nightmarish. That won’t change no matter how public transit is in place. 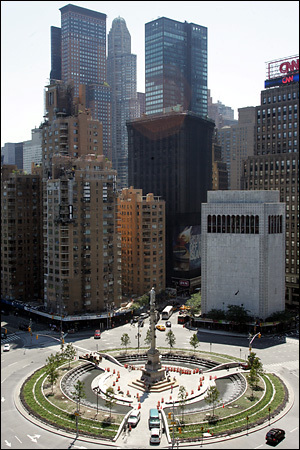 Columbus Circle in Manhattan is an example of a compromise solution. It’s a signalized roundabout. There are three main crosswalks to enter the monument area. People can always get in and out and traffic always moves smoothly through the circle. Sorry, just realized that the image shows a few cars and construction cones in the monument area. It must be a construction photo, but it does show the relationship of the crosswalks and access points into the monument area. sorry, the pdf on your link shows the original plan as one way. It was natural to think that your proposed change was in reference to that plan. Missed the sentence about how it has already been scrapped. Since that has already been abandoned for a two way proposal I will wait until wait to see what is proposed by the City and State. I think a two-way proposal will not be far off from yours. There are only so many options.